The average return doesn’t exist! Ask a random stock market ‘guru’ at the beginning of the year what he or she expects what equities will do that year and you will probably get an answer like this: ‘Well uh… somewhere between the 5 and 10%.’ Plus or minus 20%, or even more extreme, is (almost) never the answer. And while that may sound logical, it is, in fact, not! Please take a look at the graph below. It shows the calendar year returns on the Dow Jones Industrial Average Index since 1900, ranked from lowest (left) to highest (right). 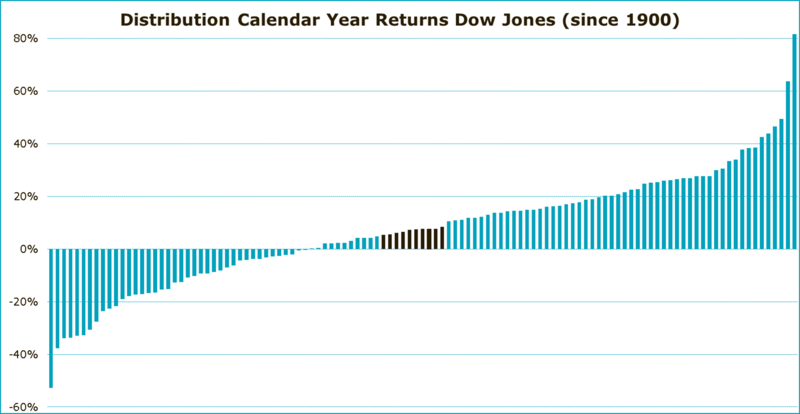 During this period, the return on the Dow Jones has averaged 7.3%. From this perspective, a return forecast of 5 to 10% doesn’t sound that crazy. You take some safety margin around the long-term average and you’re probably good, right? Wrong! A forecast like the one above is naive. If we would zoom in on the graph, we would see that, since 1900, the return on the Dow Jones has been 5 to 10% in just ten occasions (the black bars). That’s not that often given the time span of 115 years. In fact, in less than one in thirteen years has the Dow Jones return actually been in that range. Conclusion: ‘Gurus’ forecasting a return of between 5 and 10% would have got it wrong most of the time. Instead, you would have been much more successful by predicting a return of 20% each and every calendar year. In no less than 30 out of the 115 years since 1900 the Dow Jones generated a 20%+ return. This, ‘obviously’ too optimistic view on the stock market, has a success rate that is three times higher than the conservative 5 to 10% return forecast. And what about the permabears? Even they had ‘outpredicted’ the ‘play it safe’ gurus with their around average forecasts. Pessimists, who dared to predict a negative return of 20% or more for every calendar year, got it right in eleven occasions since 1900. That’s still one more than forecasters predicting a return between 5 to 10%. If anything, the statistics above show that the number of ‘doomsayers’ and ‘eternal optimists’ is probably not too high, but too low. Too few guru forecasters take the historical return distribution into account and bet on massive equity rallies or heavy losses. Perhaps there is some logic behind it. Because who has the ability to forecast the Dow Jones for 115 years? But more importantly, predicting a stock market bubble in a year when stock prices collapse is probably a bit too damaging for your guru status. 1. Individual years have nothing to do with average return over multiple years. 2. The wide swings is why nobody has discipline for buy and hold.